Also available from Barnes & Noble and wherever books are sold. Click here to buy this border classic from Amazon! 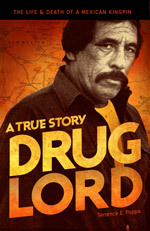 » DRUG LORD NOW AVAILABLE IN SPANISH! Cartel violence in Tijuana continues with no end in sight as 11 killings were registered in a 24-hour period earlier this week. The deaths brought the number of homicides to 650 in 2018, according to government statistics as reported by local media. Authorities reported more than 100 homicides during the month of April. Breitbart Texas previously reported that according to the attorney general’s office of Baja California, most homicides are going unsolved. This has contributed substantially to the current drug cartel violence. Of 132 registered homicides to start 2018, only five resulted in arrests with a total of 11 suspects detained. This week’s violence began during the early morning hours of Monday, April 16 in the colonia Reforma neighborhood, local news outlets reported. Officials discovered the decapitated corpse of an unknown male, 30-35 years of age. Later that day, at 11 am, police located the body of a 40-45-year male with gunshot wounds in the Hacienda Las Delicias Tercera Sección. At around 2 pm, in colonia El Lago neighborhood, officials located the body of a 41-year-old female who sustained numerous knife-type stab wounds. Several hours later, a 25-30-year-old male died after being shot in a vacant lot in colonia Los Venados neighborhood. Shortly thereafter, officials discovered the decomposing corpse of an unidentified female in the colonia San Ángel neighborhood. Several minutes later, police found the body of a 35-year-old male in the colonia García neighborhood with gunshot wounds. » The aggressive prosecution of border-crossers is straining the courts. Will ‘zero tolerance’ make it worse?